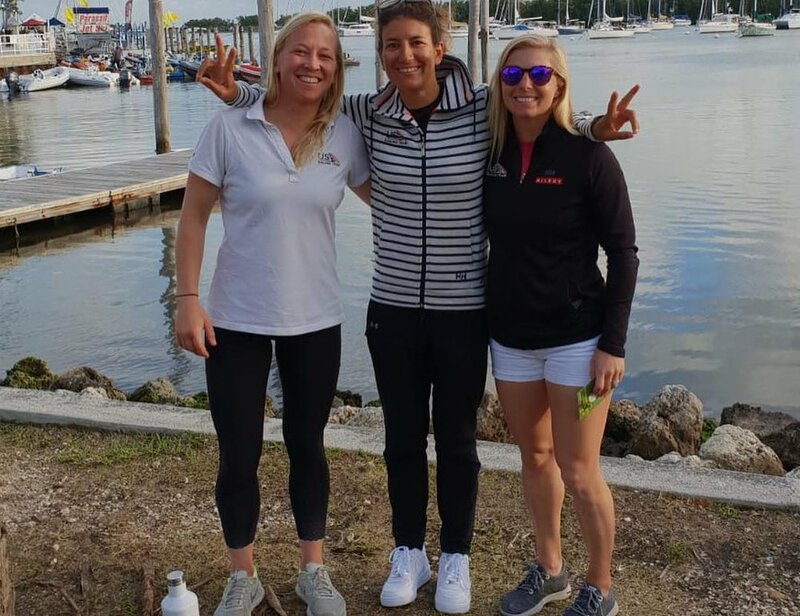 HWCS Miami was the first event in a two-regatta trials for the Pan-American Games, and we currently lead the next American team (Paris Henken and Anna Tunnicliffe Tobias) by eight points. 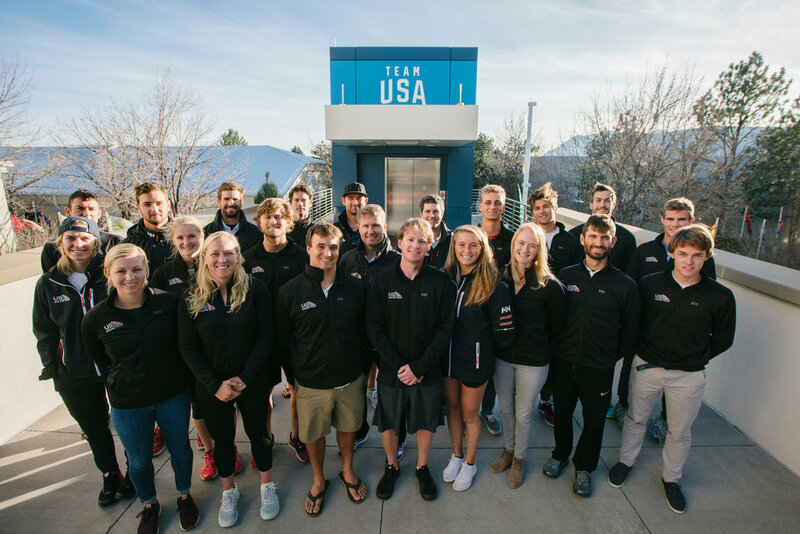 The American team with the lowest combined score from the events in Miami and Palma will represent Team USA at the Pan-Am Games. The sailing events will take place in Paracas, Peru on August 3-10, 2019. We look forward to defending our lead in Palma de Mallorca, Spain next week. 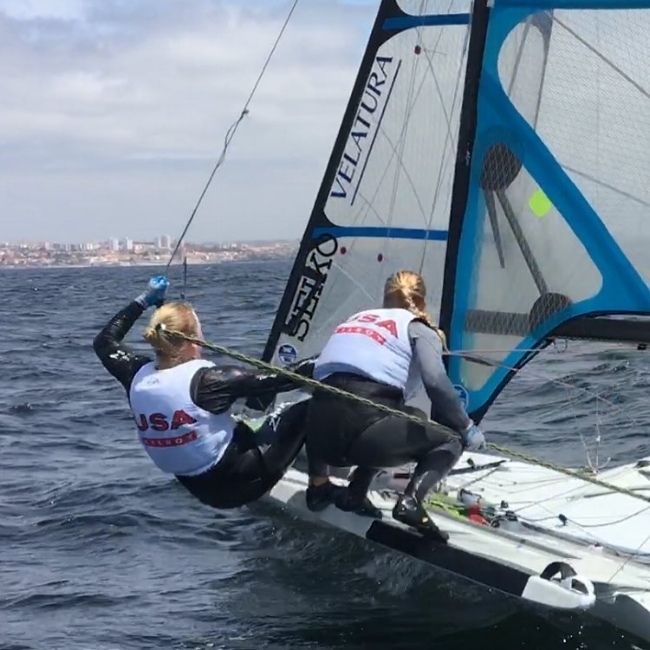 The Pan-American Games will be the North American continental qualifier for the Olympics, which means the top placing North American country will earn a berth (for the country, not the individual sailors) at the Olympics. Read more about the Pan-Am Games Selection process and event here. With our top ten finish in Miami, we are are honored and excited to qualify for the 2019 US Sailing Team (USST). The USST has become an immensely supportive network of coaches, managers and friends whom we admire and learn from constantly. We are so grateful to have the team behind us as we enter this next critical stage of our campaign. More will come soon about the official team, but you can read about the other athletes who qualified here. At the half way point of the regatta, we met our first goal of qualifying for the Gold Fleet and we live to fight another day! We are steadily clawing back from a couple rough races on the first day, and we currently sit in 28th/60 boats, merely 22 pts from the top ten. The Qualifying Series ended today, so the fleet has been divided into Gold (top half) and Silver Fleets for six more races before the Medal Race (top ten). Our primary goal here in Aarhus is to secure one of the 20 country berths for the USA at the Tokyo Olympic Games, which means finishing in the top eight countries. For the next six or seven races, we will battle with 19 other nations for those spots, and at the moment we are only 22 pts behind the eighth nation. We’re charging it! The points are extremely close across the fleet because the racing has been really tight and challenging. Each day we’ve seen a shifty, offshore breeze, and even the leaders have had races deep in the fleet. We’re focusing on keeping our minds sharp, taking this long regatta one race at a time, and fighting for every last inch. In case you missed it, here is the link to our best race yet, when we finished 2nd on the first day of qualifying: https://youtu.be/EysOkqIGZjk. Cheers to more of these! Day Two: We saw big breeze and moved up 9 places in two races! This was our best day yet. We love when it's super windy and chaotic. We had two solid races in 15-20 knots. We took big risks, sailed the boat hard and were very happy to post a 5th and a 13th. Day Three: Yesterday we hurried up and waited. After a 2 hour postponement on the water, we drifted around the course for a challenging 45 minute race. We absolutely nailed the start at the pin end, but unfortunately, a couple minutes after the start pressure filled in from the right side and benefitted every boat on the racecourse except us. We went from winning to 25th by the top mark. But we clawed back and finished 19th in that final race of qualifying. The Qualifying Series (for Gold Fleet) ended and we made the cut- Goal #1 complete! Thanks for following along! Your support and words of encouragement mean so much to us! We just wrapped up the 49er European Championship in Gydnia, Poland with a team best finish of 5th place overall! Over 6 days of racing, 14 races + 1 medal race were completed in primarily light air and choppy sea state. We had 12 top 10 finishes and are proud of this because light air has generally been a weakness for our team. We sailed a really consistent qualifying and finals series in challenging conditions. We went into the medal race (short, 2 lap course worth double points) on the last day in 4th overall with all 3 medal positions within reach. It was a tricky day with an offshore breeze and small rain squalls moving thru which made the pressure incredibly unstable and hard to read. After sailing most of the race in 4th place, the last downwind run became especially unstable. In this place we had secured a silver medal by keeping the Brits, Swedes and Spanish behind us. With the Spanish far behind, the focus was on beating the other two boats who were splitting on the run, leaving us with a tough decision on how to cover. We gybed back to cover the Swedes in what we thought was nice pressure. Unfortunately it didn't play out as planned and the Swedes passed us and we only finished 1 ahead of the Brits with not enough gap to earn a medal. It was an exciting medal race and although we are bummed to be only 2 points from a medal, we are really excited about our progress as a team to be playing at the top like that! Our starts were a huge improvement overall, with an average a score 4 out of 5 by coach. We also made a lot of steps forward with small things around the race course that are adding up. Now we are each home for a week before heading to Aarhus, Denmark for training and the World Championship! Very exciting!! Thanks for following along! Event highlight: Maggie turned 29 years old and Steph made sure absolutely everyone knew, including the camera crew and entire regatta. We finished 11th out of a very competitive field of 60 boats, most of which will also compete in the World Championships in August. This is the second event in a row that we’ve finished narrowly outside the medal race cut-off of the top ten. As gut-wrenching as that might sound, the disappointment only makes us hungry for the next event. And luckily we don’t have to wait long before the European Championships start in two weeks. 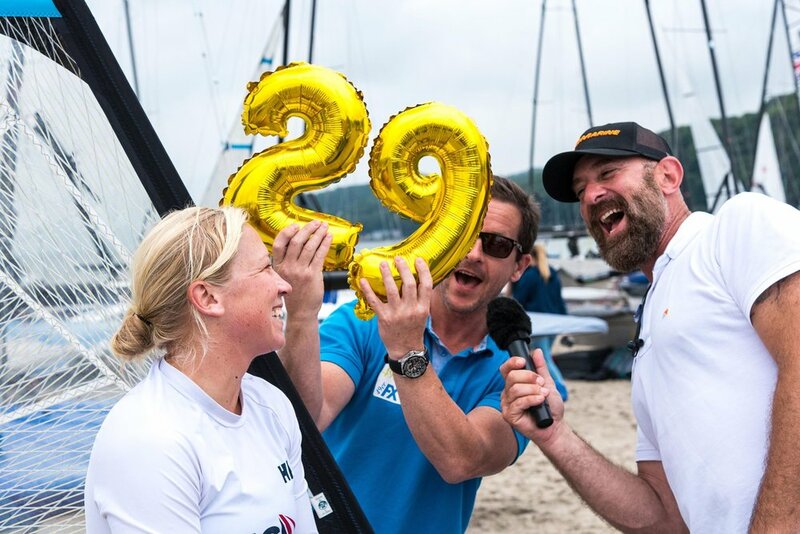 Kieler Woche is a truly one-of-a-kind event, and the numbers speak for themselves: 1,870 boats, 4,000 sailors, 60 nations, and 495 races held over 9 days of racing for a wide variety of classes. Sailors flock from all over Europe to camp out in the oversold (cold, wet and rainy) campgrounds. Additionally, the event village is like a well-organized state fair with sausages, schnitzel, beer mugs and crepe stands. Kiel Week is a special experience on and off the water. We started the event with a bang posting snake-eyes (or two first place finishes) on the first day. The races were puffy, shifty and somewhat random - Steph loves this condition. We were able to keep our cool at the mark roundings, sail smart on the beats and stay in the front pack all day. It was an awesome feeling and a great experience to wear the yellow pinnies on day two. The following days of racing were tough. We struggled to post consistent scores and put up several double-digit scores in the remainder or qualifying and Gold Fleet Finals racing. One statistic recorded by our coach, Giulia Conti is pretty revealing: our finishing position in almost every race was between 5-15 points better than our first windward mark rounding. Or in other words, we were starting the race behind and paying catch-up everytime. To execute starts at a very low percentage, but still finish the regatta in 11th place means that we’re fast, sailing smart, but really need to work on getting off the starting line more consistently. Luckily Kiel Week was a tune-up regatta for the next two championships that really matter, the Europeans and World’s. Our objective this past week was to identify the areas we need to improve, and seeing these weaknesses so clearly is a blessing this early in the summer season. We have 4 weeks and lots of racing before the Worlds begin, and we’re going to tackle the starting line head-on! Now we go home for a week before we return to Gdynia, Poland for the European Championships. I want to take this chance to give you some honest and personal insight about the pressures of campaigning. We finished two solid (and grueling) training blocks in Aarhus, Denmark before we relocated to Germany for Kiel Week regatta. We were in Denmark preparing for the Aarhus World Championships, August 1-13. The Worlds will be a major benchmark in the 2020 Tokyo quadrennium because it marks the beginning of the Olympic Trials and the half-way point in the quad. Every US sailor at this event has one specific goal: qualify the country for a berth at the Olympic games. In the 49erFX class, the top eight countries in the final standings will secure a berth at the games for their country, then the country trials can begin. The rest of the berths will be allocated at the 2019 Worlds and at last-chance continent qualifiers. Long story short, all that matters is being top eight countries at Aarhus Worlds. Hearing the words “Aarhus Worlds” gives me a nervous feeling in my belly like final exams in college. I remember specifically one final for an Econ class with a crazy professor who wouldn’t tell us the format. All we knew was that it would be hard and some people would fail. All-nighters in the library wouldn’t help because if you didn’t know the material yet, you weren’t going to figure it out in the last desperate hours. A really hard regatta feels similar to those treacherous tests because we can train on and off the water as much as possible, tick off all the boxes we can imagine, but we still don’t ever know exactly what to expect. The conditions will never be the same day to day on any two racecourses. The competitors can be familiar at best. And we can demonstrate our capabilities to ourselves in training a million times over, but there is no guarantee that we can execute what we’re doing in practice on the racecourse 100% of the time. We know that we can only affect the things that are in our control - our equipment readiness, our physical shape, our moods, our food, our routines, communication, etc. But at the end of the day, we’re competitive athletes, and we want to perform for our team, our country, our supporters, our families, and ourselves. We can read sports psychology books over and over again, and we can tell ourselves a million times that “results don’t matter; keep the big picture in mind; focus on the process of improvement; trust that results will come; focus on the things that are in our control…” While we do genuinely believe those mantras, we can’t deny that sometimes results DO matter. And it’s our job to figure out how to not let the pressure of what we want to achieve affect the process of getting there. During the Aarhus training, two months prior to worlds, we needed to spend as much time as physically possible on the water. We averaged 3-4 hour sessions on the water everyday. We sailed against some of the best teams in in the world, including the Kiwis, the Danes, the Swedes, the Norwegians and the Argentinians. We had some shining moments and made huge progress in critical areas on the racecourse like starting mechanics, mark rounding’s, and upwind speed off the starting line. We are encouraged and excited by our steps forward, but we also know that it’s not always easy to apply what you learn in practice onto the racecourse immediately. So we’re trying to be patient with this process, and to let our desire to reach our goal motivate us in a positive way. Aarhus is a really challenging venue. The breeze is typically offshore, so it seems that many racecourses will be plagued with oscillating shifts and a huge range of velocity. After sailing on the race course areas, we concluded that there were no patterns to the shifts and instead we should expect randomness. Much like that Econ test that gave me so much anxiety as a 20 year old, we will go into the Worlds not knowing what to expect from this venue. But this will be different because we’re older, wiser and stronger than we’ve ever been, and we have a fantastic team supporting us. We are well-prepared for this test, and we’re excited to get racing. We will allow our thorough preparation to give us confidence going into the event, and we can’t wait to light it up in Aarhus! We had a great week of training in Cascais, Portugal with the Singaporean team Kimmy Lim and Cecilia Low. Just outside Lisbon, Cascais is the most southwestern tip of Europe on the Atlantic Ocean, or in other words, we were as close to home as possible on the European Continent. The focus of this camp was boat-handling on very short racecourses. Often times I would set the kite, douse it immediately, then we would do a 360-degree turn around a mark, and re-set the kite again. As our coach Giulia says, “it is us against the boat” in these gut-busting drills. In the 49erFX, so much distance on the racecourse can be gained or lost in the maneuvers that we spend a majority of our time perfecting the most basic things, like tacks and gybes. These drills were designed to push my limits physically, and Steph’s limits mentally. My job is to pull as hard as I can, and Steph has to drive the boat on a course that makes my life easier. Happy crew, happy boat! This training also tested physical fitness and stamina. For example, my heart rate one day reached 194 bpm during a short course drill, and was above 180 bpm for 15 minutes of the 90 minute session. Fortunately, as the week progressed, our skills did too and we executed the maneuvers at a higher percentage despite the cumulative fatigue. This means we are getting stronger and our time in the gym is paying off! The conditions in Cascais were particularly challenging because the strong, predominant wind came from the shore, so it was gusty and very shifty. Sometimes the wind would go from 5 knots to 15 knots in a single puff, and shift 30 degrees. Needless to say, we did some swimming. But it was a great chance to work on anticipation of velocity changes and smooth transitions, even if that is all just guesswork. We sailed against Kimmy Lim and Cecilia Low from Singapore. Their coach, Fernando Quo, generously coached both teams throughout the week. We enjoyed a great dynamic on the water pushing (and encouraging!) each other through six tough days. We are also so grateful for the girls’ generosity off the water as well, lending us a boat, sails and all their equipment. Cacais was a great venue and we are grateful for the solid training. 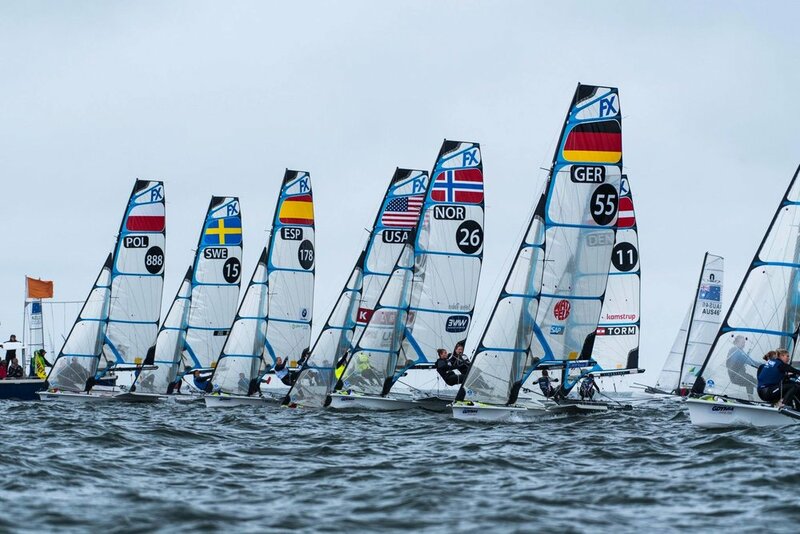 Next up is a technical training camp in San Francisco with the US Sailing Team. We are really excited to learn about the new technology developments from the USST and our supporting sponsors, and for the chance to be together as a team. Recap: The European regatta circuit began at the Princess Sofia Trophy in Palma de Mallorca, Spain last month, and it was a harsh dose of reality for us. In the fleet of 53 boats, we finished just below mid-fleet. We were reminded how much work lies ahead of us, how tough the competition is in this fleet, and most importantly that we absolutely love the challenge of this sport. The two-day qualifying series was sailed in light and shifty breeze. We struggled to get off the starting line cleanly, which made the races extremely difficult. We constantly passed boats around the race course, but we definitely made our jobs harder than they needed to be. We missed the gold fleet cut-off of top 25 by only a few places places, and had the chance to battle some other great teams in Silver fleet. We focused on small tactical moments, like creating our pre-race game plan and communicating it throughout the race. We focused on small, process-oriented goals to keep our big picture mission in focus: use every race as a learning opportunity and appreciate the small gains. Posting a bad result always tests our patience, but it also is extremely motivating. We originally planned to spend a week at home between the regatta in Spain and the next regatta in Hyeres, France, but we decided to cancel our flights and stay in Palma to log more hours on the water. Palma delivered some epic conditions, with big breeze and huge swell, and we were so grateful for the extra time in these uniquely challenging conditions. Highlights: Crepe stand next to the boat park. Lowlights: A bad capsize recovery on the windy day cost us DNF (due to the time limit expiring). Moving forward, sounds like we need some more capsizing practice! A bad regatta result can sometimes be the best motivation to spend more time on the water, work harder in the gym, re-examine our goals and focus on the process. And for that reason, we’re glad to have gotten it out of the way so early in the season! Onwards and upwards! A light air regatta is what the coach ordered and that's just what we got. It was the perfect opportunity to continue working on our light air upwind technique as well as getting off the starting line in a really good fleet. The Sailing World Cup regattas are by invitation only and therefore draw the best teams in the world. Results showed a lot of inconsistency in our scores. However, taking scores out of the picture, we accomplished our goal of executing starts. Our coach, Giulia Conti, scores us on each start and for this regatta (11 races) we received an average score of 3.45 (out of 5), with 4 of the starts being a 5. This is a huge improvement from the Miami event in January, where we averaged 1.875 in 8 races. This scoring reflects our positioning and acceleration technique. A few of the races we simply chose the wrong game plan which led to higher scores and some races we didn't get locked into our mode soon enough off the line forcing us to tack out, also leading to higher scores. This is the next step for us which will help us produce more consistent and better scores. Highlight: that feeling when you crush a start!! Lowlight: a really bad "low tide" ocean smell at the launch ramp...and the launch ramp itself! Progress isn't always linear. We must focus on the optimizing the process and trusting the results will follow. We are keeping our eyes on the prize for the World Championship this summer in Aarhus.